Save a minimum of 30 lbs. off the front of your S550 drag or street/strip car! Designed to work with Strange race struts, custom built with S197 lower mount and S550 upper mount to eliminate the S550 double ball joint assembly(not included). Will accommodate stock brakes as well as lightweight race brakes(not included). Will also accommodate stock EPAS rack or manual rack(not included). 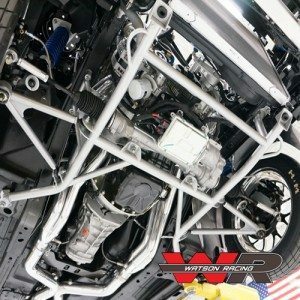 The Watson Racing S550 Lightweight K-Member and Suspension Package are essential for the serious racer looking to shed a significant amount of weight. Constructed of 100% TIG-Welded full chromoly construction, a complete kit to get you down the track, FAST. Ultra light-weight: The Watson K-Member alone is 30 lbs lighter than the stock K-Member. Control arms & Motor mounts (included) + your light drag brakes offer additional weight savings! Greasable rod-ends +greasable/refuildable Howe precision ball joints ensure long service life. Maximized geometry for minimal bump steer. Utilizes S197 spindles for variety of brake options and simplified lower control arms. Retains factory EPAS electric steering rack and radiator mounts. Intended for Strange Double Adjustable coilovers w/Watson-specific valving, using S550 upper mounts. Intended for Strange Double Adjustable Coilovers with Watson-specific valving, using S550 upper mounts. Kit includes: K-Member, Control Arms, Adjustable Bump Steer Kit, Watson Racing Solid Coyote Engine Mounts, and all necessary hardware for installation.